Please join us on Tuesday, October 16th, to hear from preservation architect Sabina Fabris about the garden restorations at the Château de Chambord. The event is hosted by the French Heritage Society, the Architects Foundation, and the Richard Morris Hunt Prize. 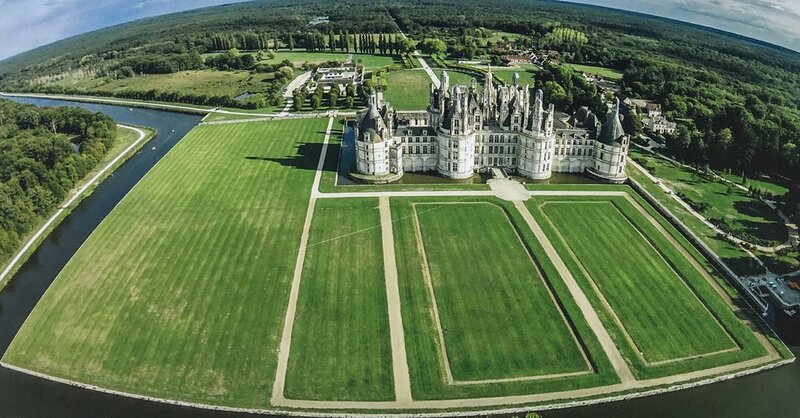 Situated in the Loire Valley, the breathtaking Château de Chambord is an outstanding example of early French Renaissance architecture. In the 18th century, engineers succeeded in draining the marshes surrounding the castle, creating a plateau for the installation of beautiful formal gardens, but these gradually disappeared due to lack of maintenance in the 19th and 20th centuries. Extensive historic research supported by on-site archaeological investigations allowed head architect Philippe Villeneuve to redesign the gardens precisely as they had existed in the 18th century. In 2017, the gardens were replanted thanks to private funding from American philanthropist Stephen Schwarzman. Architect Sabina Fabris, Project Manager at Philippe Villeneuve’s agency, oversaw all phases of the project, from research through design development and installation. Sabina Fabris is a preservation architect, Richard Morris Hunt Prize Fellow, and board member of Docomomo France. Currently Senior Project Manager at the Paris firm of Philippe Villeneuve, Architecte en Chef des Monuments Historiques. Fabris graduated from the École Nationale Supérieure d’Architecture de Versailles before specializing in historic preservation at Paris’s École de Chaillot. She has worked in adaptive reuse, interior design and historic preservation since 1999. She participated in a one-year exchange program at the University of Illinois, and was chosen as Richard Morris Hunt Fellow in 2002, studying historic industrial architecture throughout the United States. Her current projects include restorations at the Château de Chambord and the Cathedral of Notre-Dame de Paris.